As a father of two kids with special needs, I understand that preparation and patience are essential when fishing with children. Kids have short attention spans and this is only amplified when fishing. If you don’t catch fish quickly then you’re likely to be bombarded with complaints of boredom. Therefore you will need to plan ahead and maximize those opportunities. I have hosted many family fishing clinics and developed some key strategies to ensure fishing is fun, safe and rewarding. This guide will teach you the basic fundamentals to gaining a new lifelong fishing buddy. These recommendations provide a starting platform to get your kids eager for more fishing action. Take your kids to your local tackle store and buy them an appropriate rod combo to match their size. Don’t make them use your gear which might be too long and heavy. There are many kids rod combos on the market. You can start a big retail outlets such as BCF kids combos or combos such as the Shakespeare Amphibian, Mojiko small fry & Shimano Kidstix are terrific and affordable options. Add a tackle box with hooks, sinkers and fishing line to get them excited. Put them in charge and let them choose the styles and colours. It’s a good idea to purchase a 2 piece rod which can be easily stored in the car boot. You will have enough work on your hands so keep the packing simple. Pack the fishing rods, some bait, a landing net, a tackle-box with hooks, sinkers and line and you’re ready to go. Make sure you setup the fishing rods before leaving. This way the kids are ready to cast when you reach your destination. It’s not a good idea to have the kids sitting around for 15 minutes watching you rig up. Pack plenty of snacks, a couple of drinks and a chair for the kids to sit on. Don’t forget to be sun smart and pack sunscreen and hat, even on overcast days, you can easily get sunburnt. Bring alternative activities such as balls, a cricket set, bucket and spade for times when the fishing action is quiet. BUT leave the gadgets including iPad and iPhones at home. The old saying replaces the Xbox with a tackle box. 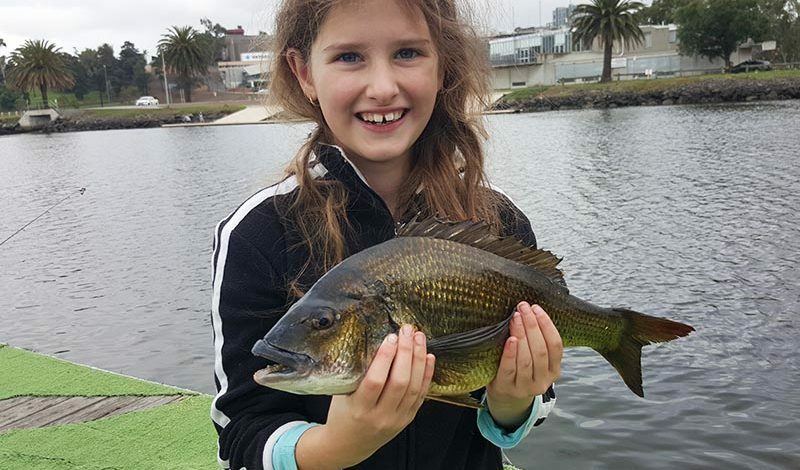 Pack a camera and remember to capture the moment by taking photos when the kids land a fish. Location is critical, so make sure your chosen destination is somewhere where you have caught fish in the past. Somewhere with basic amenities such as nearby toilets. Id strongly suggest picking a location that doesn’t require long travel times. Pick somewhere fun to fish like the beach, river with playgrounds and walking tracks. This way kids will associate fishing with fun. If your not catching fish the kids can still have an enjoyable day doing an alternative activity at a fun location. This won’t deter them from future fishing sessions. We have reviewed over 125 fishing locations within Victoria to make that decision easy for you. Target bread and butter species that are quite easy to catch. Species such as mullet, salmon, whiting, bream, flathead, pinkies, trout, redfin, leather jackets and even carp are ideal choices. I enjoy taking my kids to estuary systems and catching lots of on mullet on bread. This way the catch is frequent and the fish are a size that the kids can easily handle. As the kids get bigger and become more accomplished anglers then branch out to bigger species that are a little more challenging to catch. Teach your kids about the different species of fish and how to properly handle them. Such as the dangers of flathead spines and redfin gill plates. Always lead by example by handling fish with care and practicing catch and release. This should be your preferred option and the kids will get a buzz watching fish swim away. It also teaches kids the importance of local fishing sustainability. However, if you do plan to keep a couple of fish to eat then make sure you follow the legal size limits for your state. When planning research the best baits for the area your fishing and species of fish your targeting. This way your prepared and have the best chance of catching fish. Generally, you cant go wrong in most areas using pilchards, pippies, bread, blue bait, whitebait & scrub worms. To make things easier for you we have created a local species guide which highlights the best baits to use for certain species of fish. A fun activity with the kids in its own right can be collecting your own live bait such pumping bass yabbies, crabs or sandworms from the beach. Be calm, patient, encourage & set realistic expectations. It is key to remain calm and have a positive mindset. It may be challenging but show immense patience and continually encourage your kids. Your kids will feed off your emotions so you need to have a positive one. Temper your own expectation as fishing trips don’t always go to plan. For instance, you may not catch any fish or the kids might misbehave. However lowering your expectations will ensure you keep persisting until you find what works for you and your kids. Don’t forget to make The experience fun but always put safety first. If you’re planning to fish as well then only take 1 rod for yourself which will allow you to fish but still keep the focus on your kids. Engage with your kids throughout, encourage them over and over again, keep reinforcing that there doing well. If you’re not getting a bite then show them the same respect and move onto something else. Kids are impulsive and can act quickly without thinking. So make sure your doing everything to ensure a fun days fishing that’s safe. Some suggestions include when picking a locations avoid strong surf, slippery rocks, step ledges. Avoid areas renowned for pests like snakes. Always make sure there is distance between people when casting. Ensure you teach your kids about not walking behind others when they are casting. If you go out on a boat remember to only take the kids in really calm conditions. To make sure they have a life jacket that’s appropriate size and been serviced. . Sometimes your kids will surprise you with how quickly they pick up a new activity and how enthusiastic they can be. Take a look at this video I recently took my 12 year old daughter on a small runabout boat. She by herself caught 6 squid and 5 flathead on light spinning gear. Flicking squid jigs and soft plastics all be herself. She had a wonderful day. I ensured the conditions were calm and that there was constant positive reinforcement. I made sure she had sunscreen, water snacks and that she wore an appropriate life jacket. She even cleaned and helped cooking the squid. Slowly build up your child’s exposure to fishing. Start with brief fishing sessions then gradually increase the duration. Continually build up their skills by teaching them how to cast, how to use the reel properly. As their skills improve encourage them to try lures and soft plastics. Take the kids to the local tackle store and get them to choose their own plastics with funky colours and shapes. Eventually get them to assist with rigging up, tying knots and spooling reels. Teach your kids some basic knots and rigs. Teach them the uni or blood knot with a simple running sinker rig which is great in many situation. Continually educate your children about the different fish species your targeting. What their legal size limits are, how they should be handled, if they’re dangerous, and always encourage catch and release. Always look for opportunities to make the experience more enjoyable. Some ideas could include packing a picnic, having a bbq and enjoy a nice lunch with the kids whilst the rods are set up and ready to catch a fish. Practice catch and release. Young kids won’t comprehend the idea of keeping fish for food and they enjoy watching a fish swim away. Often I will take my kids into a shallow area where they can go in the water and release the fish which is something they love to do. Go camping and make fishing a key activity that is done during camping. Taking some time out to try and spot fish such as stingrays, dolphins and small schools of fish, or other active animal life such as birds, pelicans or butterflies. This always makes the kids excited. If your fishing on the beach add in some fun beach activities such as building sand castles, collecting shells, walking in the shallow water, playing cricket, or having a brief swim. Recently I purchased the Savage Gear lure making and painting kit. It was very affordable and I had hours of fun painting soft plastics with the kids. This is an amazing way to spark their interest by designing their own colours and patterns and catching fish with them. Fish for small periods at a time and build up their patience levels. Knowing when to stop is key to ensuring they will want to go again. If you take them for hours and hours at a time when beginning they will immediately connect fishing with boredom. If you expect them to sit around for hours then your setting yourself up for failure. You will be more successful starting with short sessions, as short as 30 minutes, then building them up. Don’t take them too frequently, there kids and need to have their own hobbies. Take breaks between fishing to allow the kids time to do their own activities without feeling obligated to fish.